Democrats and President Obama claim the "Stimulus" saved or created jobs. The data proves them wrong. Forty-nine of fifty states have lost jobs since the "Stimulus" was passed. According to the data, 49 States and the District of Columbia have lost jobs since stimulus was enacted. Only North Dakota has seen net job creation following the February 2009 stimulus. 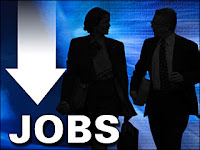 While President Obama claimed the result of his stimulus bill would be the creation of 3.5 million jobs, the Nation has already lost a total of 2.7 million - a difference of 6.2 million jobs. You can check your state here.